Have you ever seen a temple lighted at night or walked on the temple grounds during the day? Do you have a picture of a temple in your home? Do you have a happy, peaceful feeling when you see a temple? Why are temples such special places? Other buildings are also built with the finest materials and landscaped with beautiful flowers. But temples are places where Heavenly Father and His Spirit may dwell. Each is a house of the Lord. All of Heavenly Father’s children who are worthy and old enough can enter the temple to learn more about His plan of happiness. In a temple, worthy members of the Church covenant with (make promises to) Heavenly Father. Heavenly Father, in turn, makes promises to them. Members of the Church go to the temple to participate in ordinances * for themselves. Many receive these ordinances when they are preparing for a mission or marriage. They also go to the temple to perform ordinances in behalf of those who have died. For example, young people who are worthy and at least twelve years old can go to the temple to do baptisms for the dead. Children who are at least eight years old can attend temple dedications. Younger children may enter the temple to be sealed to their parents. In each case, those who enter must be clean in body and spirit “because the Lord hath said he dwelleth not in unholy temples” (Alma 34:36). Before you go to the temple, your bishop or branch president interviews you and asks you about your testimony and if you are keeping the commandments and following the prophet. Only then does he sign a recommend that allows you to enter the temple to participate in ordinances or to attend temple dedications. When you are an adult, an additional interview takes place with the stake president or mission president if you want to go to the temple to be endowed, † married, or sealed. Each day as you choose to live the commandments, keep your baptismal covenants, and try to be more like Jesus Christ, you are preparing to go to the temple. If you are pure and clean when you enter the temple, you will feel His Spirit. The temple will always be a place of love and beauty for you. 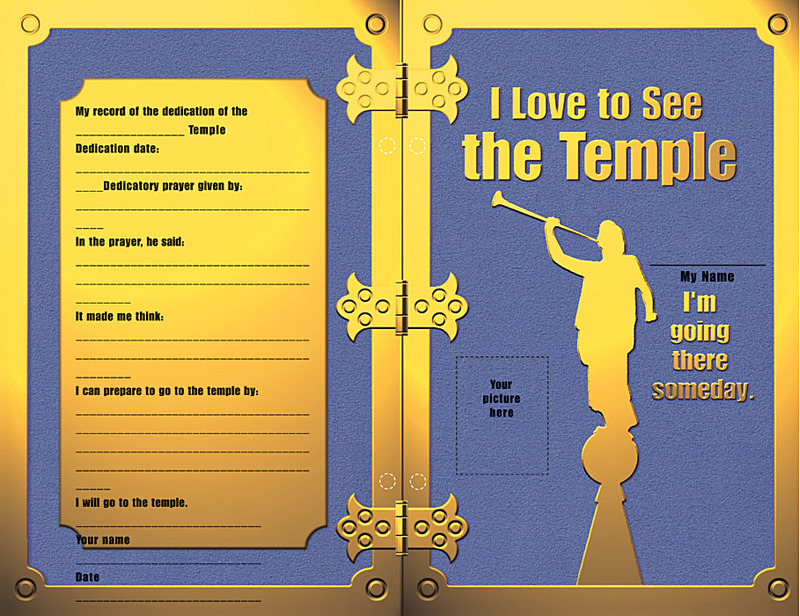 Make a temple booklet to add information to throughout the coming year. Remove page 31 from the magazine. Glue it onto construction paper, then trim it. Glue a photograph or drawing of yourself in the space on the front cover. Write your name on the line. Enter information about a temple dedication that you know about or learn about during the coming year on the back cover. Fold the covers along the hinges and punch holes where indicated. 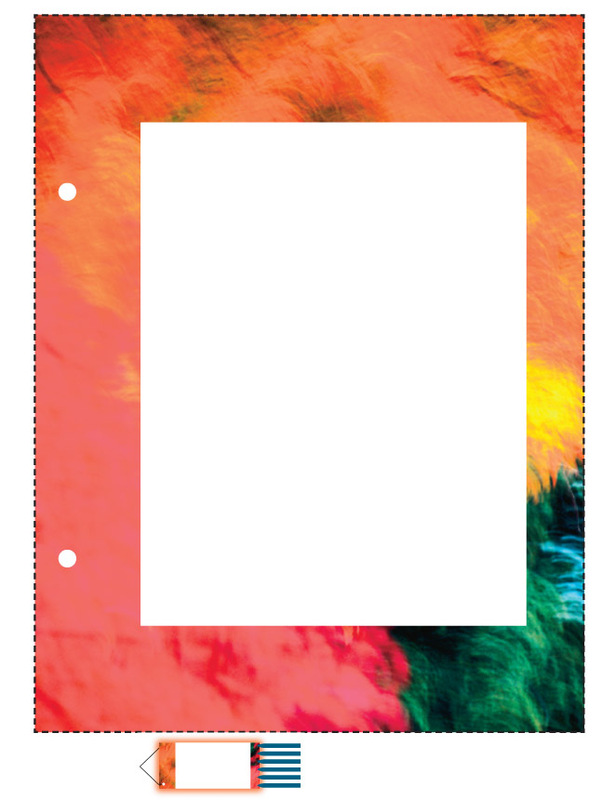 Fold or cut paper to fit in the notebook and punch holes in the pages, aligning the holes with the ones in the covers. Place the blank pages between the two covers. Thread a 2′ (60 cm) piece of string or yarn through the holes and tie a bow on the front of the booklet. Record the things you learn about temples this year in your booklet and share them with your family. 1. Discuss the times when Jesus Christ went to the temple in Jerusalem during His mortal ministry. He went as a young boy and declared He was doing Heavenly Father’s work (see Luke 2:41–49); He drove out the people who were defiling it (see John 2:13–17); He taught at the temple (Matt. 21:23–46; John 7:14–53). Ask a child to step out of the room. Hide a picture that represents one of the following things we need to do to be worthy of going to the temple: baptism, paying tithing, living the Word of Wisdom, being kind to family members, sustaining the prophet, gaining a testimony of the Savior. Bring the child back into the room and have him or her search for the picture. Have the rest of the children sing “I Love to See the Temple” (p. 95), singing louder as the child gets closer to the picture and softer as he or she moves away from the picture. Once the picture is found, discuss how the principle represented will help the children prepare to go to the temple. Explain that finding the picture was easier when the child listened to those who were trying to guide him or her. Explain that it is easy to be ready to go to the temple if we study the scriptures and follow the teachings of the prophet, other Church leaders, and parents. Sing a song that relates to the picture: tithing—“I’m Glad to Pay a Tithing” (p. 150); Word of Wisdom—“The Lord Gave Me a Temple” (p. 153); love for family members—“A Happy Family” (p. 198); heeding the prophet—“Follow the Prophet” (pp. 110–111); gaining a testimony of the Savior—“The Church of Jesus Christ” (p. 77). 2. Teach the relationship between the covenants we make and the blessings we receive. Hang the following pictures from the GAK down the middle of a wall: baptism (601), gift of the Holy Ghost (602), sacrament (604), and temple marriage (609). On one side of the pictures, post a wordstrip that says I Promise; on the other side, The Lord’s Blessings. Divide the children into four groups. Have a teacher direct each group in reading one of the following scriptures and then discussing the covenants (promises) and blessings mentioned: Mosiah 18:8–10; D&C 121:45–46; D&C 20:75–79; D&C 109:20–23. Prepare two containers for holding wordstrips with quotations from the above scriptures. Label one container “I Promise” and the other “The Lord’s Blessings.” In the I Promise container, put these twelve wordstrips: Bear one another’s burdens, Mourn with those that mourn, Stand as witnesses of God, Serve Him, Be full of charity, Let virtue garnish thy thoughts unceasingly, Take upon them the name of Thy Son, Always remember Him, Keep His commandments, No unclean thing shall be permitted to come into Thy house, Reverence Thee in Thy house, and Bear exceedingly great and glorious tidings. In the The Lord’s Blessings container, put these ten wordstrips: Be redeemed of God, Numbered with those of the first resurrection, Have eternal life, Pour out His Spirit more abundantly, Confidence wax strong in the presence of God, The Holy Ghost shall be thy constant companion, Always have His Spirit to be with them, Armed with Thy [God’s] power, Thy glory [will] be round about them, and Thine angels have charge over them. Have the children take turns choosing a wordstrip from either of the containers and reading it out loud. Have the group whose scripture the quote comes from raise their hands and tell which ordinance it pertains to. Have the child hang the wordstrip under the correct heading by the picture depicting that ordinance. Repeat until all of the wordstrips are in place. Sing “Covenants Are Promises” (Friend, Aug. 1999, p. 38) or “Keep the Commandments” (pp. 146–147). Bear your testimony of the blessings we receive from keeping our covenants. For younger children: Divide the children into three groups. Have a Primary leader assigned to each group prepare in advance simple materials (props, costumes, flannel-board figures, etc.) for the children to present their story. Have the leader tell the story to their group, then help the group prepare to share the story with the rest of the Primary. Stories: “Abraham Covenants with the Lord” (Gen. 22:1–18; Friend, Aug. 1998, pp. 34–35); “Joseph ‘Holds to the Iron Rod’” (Gen. 39–41; Friend, July 1998, pp. 42–43); the people of Ammon bury their weapons (Alma 23–24; Friend, Aug. 2000, pp. 34–35). 3. Learn “I Love to See the Temple” (p. 95) by cutting out four pieces of paper to form a simple foundation and three spires of a temple. On the foundation, write “love” and “see.” On the left spire, write “feel,” “listen,” and “pray.” On the middle spire, “house of God,” and on the right spire, “prepare” and “young.” For younger children, use simple pictures instead of words. Ask the children to discover which three senses are mentioned as you sing the first two lines of the song. As you sing, place the foundation and the first spire on a flannel board. Have the children name which senses were mentioned. Explain how feeling with your hands is different from feeling the Spirit. Have everyone sing the first two lines. Ask them to find three things that a temple is (a house of God, a place of love, a place of beauty) as you sing the next line. Add the middle spire as the children sing the third line with you. As you sing the final line, have the children discover what their sacred duty is (“prepare myself while I am young”). Place the final spire on the flannel board as the children sing that line. Sing the entire first verse several times. As you do, remove the strips one by one until the children can sing the song without the wordstrips. Teach the second verse in a similar manner. Chapel—a gathering place in both buildings. Classroom—similar to an ordinance room because it is where we are taught what Heavenly Father wants us to know and do. Baptismal font (if there is not one in your building, use a picture)—in a meetinghouse baptisms are performed for the living; in the temple baptisms are performed for the dead. Kitchen—in a meetinghouse, a place to serve food for ward or stake activities; in some temples there are cafeterias where food is served. Bishop or branch president’s office—the bishop or branch president is responsible for his ward or branch; each temple has a temple president’s office. The temple president is responsible for the temple and the work done there. If possible, have the bishop or branch president explain what a temple recommend is at this stop. Return to the Primary room and explain that temples have some other special rooms, such as the celestial room and sealing rooms. Have the children sing “I Love to See the Temple” (p. 95). Invite a speaker to talk about his or her experiences at a temple open house or dedication. 5. Tell the story “Samuel’s Scriptures” (Friend, Jan. 1998, pp. 2–3). Have the children mark D&C 131:2–4 in their scriptures. 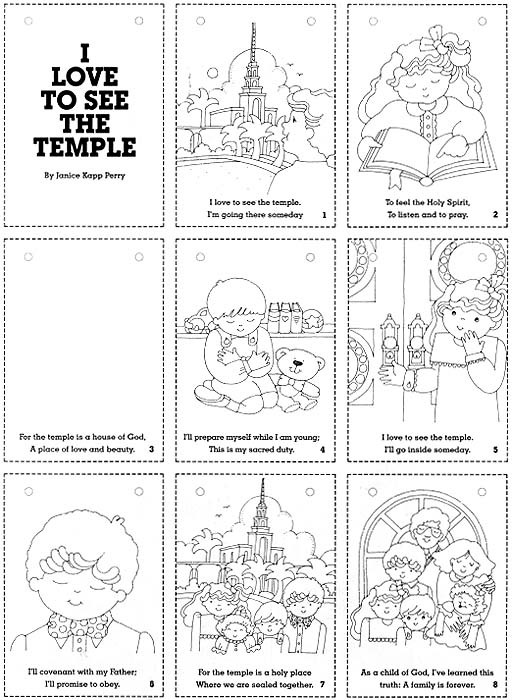 Hand out pieces of paper cut to fit in the children’s temple booklet (see Sharing Time, pp. 30–31). Have the children list five reasons why they want to be married in the temple. Ask them to add this sheet to their temple booklets. For younger children: Enlarge the game board in the back of the Primary 2 manual. Change the beginning space to “Not Preparing to Go to the Temple” and the ending space to “Preparing to Go to the Temple.” Color the spaces on the board five different colors, and in a sack have five small pieces of paper the same colors. Divide into two or more teams. Provide a marker for each team. Play the game, having a team member take at random a piece of paper, move their marker as directed, and return the colored paper to the sack. Read what the square says and briefly discuss why what is written will or will not help us prepare to go to the temple. The arrow on each square indicates which direction the team will move on its next turn. Have the teams take turns and continue playing until all the teams reach “Preparing to Go to the Temple.” If possible, give the children copies of the game board to color and take home to play as a family home evening activity. 6. Additional Friend resources: “Keeping My Promise,” Aug. 1998, pp. 12–13, 11; “Temple Light,” Aug. 1999, p. 19; “I Can Keep My Covenant,” Aug. 1999, pp. 44–46; Friend to Friend, May 2000, pp. 6–7; “Sticking to Standards,” May 2000, p. 47. Additional resources: “Nauvoo’s Holy Temple,” Ensign, Sep. 1994, pp. 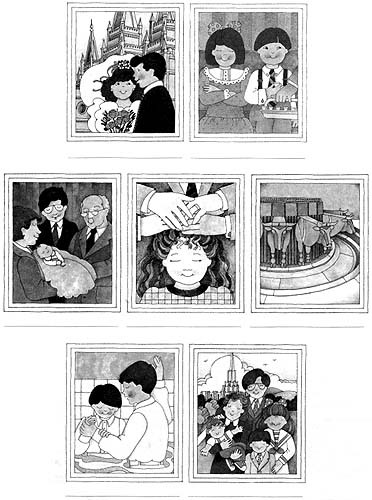 59–62; “Building Temples, Building Lives,” Ensign, Oct. 2000, pp. 23–27. The family is central to the Creator’s plan for the eternal destiny of His children (“The Family: A Proclamation to the World”). How many people are in your family? Where does your family live? What do you like doing with your family? How do you feel about your family? In 1995, President Gordon B. Hinckley (1910–2008) introduced “The Family: A Proclamation to the World,” which teaches that “the family is central to the Creator’s plan for the eternal destiny of His children.” Heavenly Father planned for you to come to earth and belong to a family. He knew that you needed a loving family to help you grow and learn how to return to Him someday. Gather for family home evening and invite your family to read the proclamation. Talk about what it teaches, and choose ways that you can work together to strengthen your family. Sing this Primary song to remind you that families can be together forever. I have a family here on earth. They are so good to me. I want to share my life with them through all eternity. Fam’lies can be together forever through Heav’nly Father’s plan. And the Lord has shown me how I can. The Lord has shown me how I can. (“Families Can Be Together Forever,” Children’s Songbook, 188). Cut out the frame on the broken lines. Glue short edges together to make a cylinder. Punch two holes in the top as shown, and tie yarn or string through them to make a loop for hanging. Cut six streamers out of paper. On each streamer, write one way you can strengthen your family. Attach the streamers to the bottom of the wind sock. Play a simple guessing game by giving a series of clues to introduce the monthly theme on the family (see “Examples of Games,” TNGC, 169). When the children have discovered the answer, write the word family on the chalkboard. Share the story of Lehi traveling into the wilderness (see 1 Nephi 2). Invite the children to share ideas from the story that could strengthen a family, and list the ideas on the chalkboard. Sing “Book of Mormon Stories” (pp. 118–19), verse three. Share the story of Noah (see Genesis 6–8). Invite the children to share ideas from the story that could strengthen a family. List the ideas on the chalkboard. Sing “Follow the Prophet” (pp. 110–11), verse three. Provide copies of the family tree from Primary 3, lesson 39, p. 196. Invite the children to put names of parents and siblings in the tree and write or draw on the back of the paper ways they can strengthen their family. Bear testimony of how the scriptures teach us ways to strengthen our families. Write the words honor and obey on the chalkboard. Explain that the word honor means to show respect for our parents, and the word obey describes our actions when we show that respect. Sing verses one and two of “Quickly I’ll Obey” (p. 197). Prepare several case studies (see “Case Studies,” TNGC, 161–62) to help the children apply in their lives the principles of honoring and obeying parents. Sing the phrase “quickly I’ll obey” between each case study. Bear testimony of the importance of honoring and obeying parents. Invite the children to share what they noticed from the video. Make a short list on the chalkboard. Compare the list with the Faith in God Award requirements in the Faith in God guidebooks, pages 4–5. Emphasize how scripture study, individual and family prayer, and family home evening can strengthen our families. Provide a copy of the wind-sock activity on page 14 in this month’s Friend. Review the instructions and gather the necessary materials to complete this activity during sharing time. Invite the children to write “scripture study,” “prayer,” and “family home evening” on the streamers of the wind sock. Sing a song that reinforces scripture study, prayer, or family home evening. (Suggested songs: “Search, Ponder, and Pray” [p. 109], “Family Prayer” [p. 189], “Family Night” [p. 195], or “Families Can Be Together Forever” [p. 188].) Bear testimony of how these activities strengthen your family. The p___________ can b______ and s__________ my f_______. Sing the first line of “The Priesthood Is Restored” (p. 89). Have the children listen for a word to complete the first blank in the sentence. When the children guess correctly, write the word priesthood in the first blank. Sing the first two lines of the second verse of “Love Is Spoken Here” (pp. 190–91). Have the children listen for two words that will complete the next two blanks in the sentence. When the children guess the words blessed and strength, explain that to help the message make sense, you will need to change the words to bless and strengthen. Write them in the blanks. Sing the first line of “Families Can Be Together Forever” (p. 188). Listen for the word that completes the sentence. Write in the word family, and then read the sentence together. Use the following pictures from the Primary 2 picture packet: 2-20, 2-27, 2-29, 2-30, 2-31, 2-32, 2-33. Give each class a pencil, a piece of paper, and a picture of a priesthood ordinance. Ask them to keep their picture a secret so they can play a guessing game. Ask each class to think of three clues that would help someone guess the priesthood ordinance shown in their picture, and write them on the paper. Invite each class to share their clues, and let the Primary guess what priesthood ordinance they are describing. As each ordinance is discovered, place the picture on the chalkboard. Invite children and teachers to share positive experiences that have blessed their lives or the lives of their family that relate to each priesthood ordinance. Bear testimony of how the priesthood blesses and strengthens families. Song presentation: “Home”(p. 192). Gather pictures of homes, or invite children to draw pictures of homes. Display the pictures and explain that even though homes look different, they are all places that provide shelter for a family.Teach the melody of the song by using the pictures of the homes as visual clues. Invite children to the front of the room to hold the pictures. Hum or play the first phrase of the song, and help the children discover the melody line by placing the pictures at different levels to match the melody line of the phrase. Teach one phrase at a time until the melody is learned. Explain that this song teaches important truths about a home. Ask, “What is in a home?” Sing the first phrase to the children and have them listen for the answer (“heart”). Ask the children to touch their heart as you sing that phrase together. Next, ask them to listen for two words that describe feelings in our hearts. Sing the second phrase to the children and get their responses (“warmth” and “love”). Sing the second phrase together. Explain the meaning of the word abound. Teach the third phrase by asking the children to listen for words that describe a hug. Sing the third phrase and get responses (“warm, circling arms”). Sing the phrase together. As you sing the last phrase, hold your arms out in front of you as if you were going to hug another person, then as you sing the phrase bring your arms close to you and give yourself a hug. Sing the final phrase with the children. Sing the first verse together. Bear testimony of the blessings of a home. Continue to ask questions that focus the children’s listening, and sing to the children as you teach verses two and three. Friend references: “Love at Home,” Sept. 2004, 42–43; “Strengthen the Family,” May 2000, 45; “Pie Dough to Play Dough,” Nov. 2006, 38–40; “Strengthening My Family,” June 2004, 36–37; “A Perfect Match,” Oct. 2006, 20–22; “A Brother’s Example,” Dec. 2005, 8–9. It is thy house, a place of thy holiness (D&C 109:13). Have you ever wondered what Heavenly Father’s house in heaven looks like? We can only imagine how wonderful it is. As we try to imagine it, we can think about our own houses here on earth. Homes are different for different people. Some children live in houses made of brick, others in houses made of wood. Homes can be apartments, simple huts, even boats. Whatever your home looks like, the most important thing about it is what is found inside. If a house if filled with love and kindness, it is a beautiful place. Heavenly Father also wants to have a beautiful house here upon the earth where we can visit and feel His love. He has commanded us to build houses for Him where we can hear His messages and receive important blessings. These houses are called temples. It is in God’s temple that we may best worship and make important covenants, or promises, with Him. Because each temple is a holy place, those who enter the temple must be worthy. They must keep Heavenly Father’s commandments. In this way love, beauty, and holiness will continue to be found there. 1. Remove page 15 from the magazine. Mount it on heavy paper or lightweight cardboard, then cut along the broken lines. 2. On page 3, draw a picture of the temple nearest your home. Color all the pictures. 3. Punch holes where indicated, and make a booklet by threading the pages together in order with yarn or heavy string. Tie the yarn in a bow on the front of the booklet. Turn the pages one by one as you sing “I Love to See the Temple” (Children’s Songbook, page 95). 1. I love to see the temple. A place of love and beauty. This is my sacred duty. 5. I love to see the temple. Where we are sealed together. 1. Using “I Love to See the Temple” (Children’s Songbook, page 95) as a guide, list and discuss some of the things that a person does in the temple: feel the Holy Spirit, listen, pray, covenant with Heavenly Father, be sealed together as families. 2. Explain that in the temple, people wear special white clothing that represents purity, cleanliness, holiness, and righteousness. In your discussion, use “They shall walk with me in white: for they are worthy. “He that overcometh, the same shall be clothed in white raiment.” (Rev. 3:4–5.) Talk about other times in our lives when we wear white (baptism, marriage, and burial). 3. Show a picture of the temple nearest you. Have younger children draw a picture of themselves standing outside the temple. Discuss with older children the history of their temple. Encourage them to write their feelings about it in their own journals. 4. Invite a Primary child who has been to the temple for a dedication or sealing to share his feelings about the experience, or invite an adult to briefly tell the Primary children of blessings he has received from going to the temple. 5. Invite the bishop or branch president to discuss temple worthiness and temple recommends with the children. Let this house be built unto my name, that I may reveal mine ordinances therein unto my people (D&C 124:40). What is an ordinance? The word has special meaning when we use it in the Church. An ordinance is a sacred ceremony that has a spiritual meaning. When we participate in an ordinance, we often make covenants or promises to obey Heavenly Father’s commandments. Look at the pictures illustrated and see if you can identify the ordinances. Write the name of each ordinance beneath its picture, using the list below. Then read the descriptions of some of the types of ordinances we have in the Church and color the frames of the pictures as indicated. Some frames may be more than one color. Color the frames around the saving ordinances red. 2. Some ordinances are performed only in holy temples. Some of these ordinances include baptism for the dead, celestial marriage, and sealings. Color the frames around the temple ordinances blue. 3. There are many other ordinances performed in the Church, such as partaking of the sacrament and the blessing of babies. How grateful we should be for all the ordinances we have. We are particularly blessed to live in a time when we have holy temples upon the face of the earth and are able to receive the blessings of temples ordinances. Without temples those ordinances would not be available for us or for our loved ones who have died. Because of temples, all people who have lived upon this earth can have ordinances of salvation and exaltation performed in their behalf. 1. Explain that when an ordinance is performed, we make a covenant, or promise, with Heavenly Father. (See “Covenant” in the 1993 Children’s Sacrament Meeting Presentation Glossary and in the Bible Dictionary.) Generally discuss some of the covenants that the children may one day be blessed to make in the temple: morality, obeying the commandments, sharing with others, sacrificing, and being like Jesus. 2. Ordinances always include covenants. Have children pair each ordinance with covenants that are made when the ordinance is performed. 4. Invite an older child who has performed baptisms for the dead to speak to the Primary children about his or her experience. 5. Sing “Truth from Elijah” (Children’s Songbook, page 90) and discuss family history research and how names are submitted to the temples for sealings and other temple ordinance work. 6. Invite a faithful married couple to express their feelings to the children concerning temple ordinances.